Like it or not, colder weather is here for most of the country and you know what that means! It's time to check the emergency kits you have in your cars! For a lot of you, these kits won’t be a whole lot different, and for others, this is your first time building it. Either way, take a look at these 16 Must Have Items for Your Winter Auto Kit and be sure that the items are included in yours! If you don’t have a kit, make sure you have one! You never know when you could be stranded on the road in the cold! A good sized Rubbermaid tote that will fit in your trunk is a great idea to keep all of your emergency items in. Candle and Coffee Can – You would be shocked to find out how much heat an empty coffee can and a candle can emit. If you were to be stranded in the cold, just light the candle and drip a bit of wax onto the bottom of the inside of the can. Use the wax to “glue” the candle to the can and let it burn. When doing so, make sure that you crack your window a tiny bit, this will ensure that any fumes that may seep from the candle will not harm you and/or your family. Also, find a safe spot to set the can instead of holding it, as it does get pretty warm. Jumper Cables – This cold weather can drain a car battery very fast. Make sure that you always have a working set of jumper cables in your trunk at all times. This will ensure that either someone who doesn’t have a pair can help get yours charged, or you could help someone in need of them. Blankets – Preferably, you should try and have at least one blanket for each person traveling in the car with you, but if you don’t have that many spare blankets, one or two is always better than nothing. If you are looking to pick up some reasonably priced blankets, look at Harbor Freight, they have some moving blankets that will run you about $5.00 and are actually pretty warm. Small Shovel – If you live in a snow prone area, you know the hassle of getting stuck somewhere. Carrying a small shovel can ease that burden. Folding shovels are a great solution for this because they save space and work just as well. Kitty Litter – Carrying a small bag of kitty litter in your trunk will help with getting you unstuck as well. 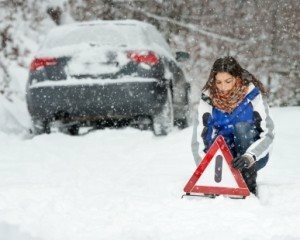 If you get stuck in a snowbank or on ice, sprinkle the litter under your tires. It will provide traction for your tires and could be the simple thing that gets you out of a tight spot. Water – I realize that when you think about being stuck/stranded, you don’t think that you will be there for an extended amount of time, but let’s face it, it could happen. Keep a tote or small box in your car that has enough water for each person who will be riding with you. If possible, you should carry enough for 3 days, but if it isn’t, a gallon or 2 could be what saves your life/lives. Food – You can survive longer without food than you can water (about 3 days for water, 3 weeks for food), but you should still carry some food items in your kit as well. Make sure that the foods you’re keeping in your car are high in protein and calories. When trying to stay warm, your body will burn calories faster than normal, meaning you will need that extra boost. Also, if you have children, be sure that you keep extra snacks in your kit for them as well. For example, things like granola bars, raisins, fruit snacks, fruit pouches individual peanut butter cups, travel soups and ready to eat tuna meals are fantastic. Flashlights – This seems like such a simple thing, but you would be amazed how many people do not have one of these in their car. If you’re stuck alongside the road at night without one, you’ll wish you had one! Also, be sure you have enough batteries at all times, in case the ones in the flashlight goes bad. Like I previously mentioned, cold will drain a battery quick so you’ll want to be sure you can easily replace them if you need. A Map – Now days people rely so much on technology. If you’re lost, you just pull up google maps or use Garmin, many people don’t know how to read a map. If you’re out in the middle of nowhere though, you may find yourself without a signal, on a road that the GPS doesn’t recognize and lost. That’s a very, VERY good way to run out of gas. Carrying a map or atlas with you will give you a third alternative to finding your way back to where you should be. You can pick up an atlas at just about any gas station for a few bucks and state maps are even cheaper. Oh and make sure you know how to read that map. It won’t do you much good if you can’t. Boredom Remedies for the Kids – Kids are kids and sometimes they don’t understand what is going on, and that makes it a little tricky when you are broken down/stranded somewhere. All that the kiddos will care about is that they’re bored. Keeping a few travel games, coloring book and crayons, favorite books, or whatever will keep them occupied in the car, will hopefully ensure that you have some time to work on the car and/or arrange for someone else to. Gas Can with Gas – This is another one of those things that you would think most people would carry with them, but they don’t. We live in a world with a gas station on just about every corner so most people don’t think that it’s needed. But you’ll wish that you had one when you are out of gas in a rural area, and the nearest gas station in 50 miles away. Keeping a gas can with just a few gallons of gas in your car could be your saving grace. You don’t need to keep enough to fill your tank, but you should have enough to get you to the nearest station. If you’re worried about the fuel degrading, add an additive like Stabil to it to keep it fresh. First Aid Kit – Another no brainer, right? Nope. It’s that whole “on every corner” thing again. Most moms will tell you that there are times in our kid’s lives where even a simple Band-Aid can go a long way. While you do not need to carry a huge kit with everything you’ll ever need, you do need to carry something that will handle most minor emergencies. Band-Aids, headache meds, allergy meds, stomach and car sick medicines, any diabetes supplies and of course any life-saving allergy medications you may need. Also be sure that your kit contains up to date medical information for your entire family. If you were in an accident, it could save your life. Inexpensive Cell Phone – There have been plenty of accidents in the winter (in any season, really) where the people involved have had their cell phone destroyed. Having a back-up is never a bad idea. It doesn’t have to be fancy or expensive, just something simple that can call out. Even if you don’t have active service on it, still keep one there. ANY cell phone in the US can call 911, even if it doesn’t have active service. Road Flares – Winter roads can be dark and very, very dangerous…especially if you live outside of the city. If you get into an accident or end up broke down, make sure that you have a few road flares on hand to set up in front AND behind your car. This will help alert other drivers that you are there so they can slow down and pass you safely, or even pull over to help! They’re cheap to buy and really are a lifesaving piece of equipment that not a lot of people think about. Spare Tire and Tools – Make sure that your car has one and that the tire itself holds air well, has good threads and could be easily changed. While you’re back there, be sure to double check that you have a tire iron and jack too. That tire won’t do you much good if you haven’t got the tools you need to change it! Most cars come with a tire iron. A Small Toolbox – Along the lines of the tire and tools, keeping a small toolbox with a few wrenches, sockets and screwdrivers in your car isn’t a bad idea either. If you end up having an issue that is an easy fix, you’ll be grateful that you put those items in there. You can pick up small hand tools pretty cheap and a small toolbox isn’t going to break your budget either.